Paintings are everywhere, on the floor, in front of the fireplace, on chairs and on the walls. Bursts of colour and creativity everywhere! 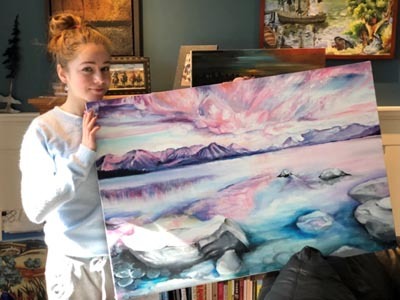 Sabine, a prolific grade 10 student at Lord Byng Secondary School and Arts Umbrella, is our youngest artist, not that age matters. Lately she has been painting from the snowy wilderness scenes from her father’s adventure photos. They take me right there with her skilled and sensitive rendering of snowy trees, forest landscapes and crests of jagged mountains. They are paintings but they also document her family’s experiences, a unique family album. 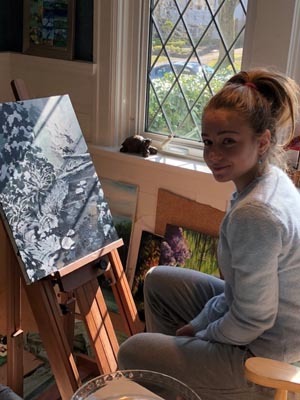 Sabine also ventures into the abstract with her informed imagination but grounds her images with just enough landscape or portraiture to allow me to venture in. 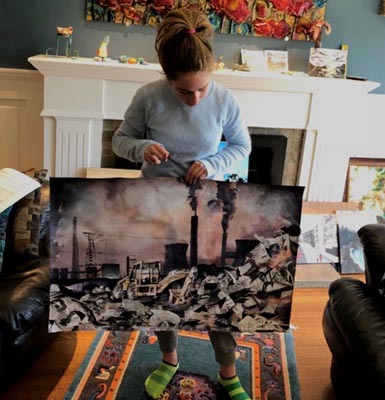 Being an art student gives her the opportunity to really explore and try out new ideas and techniques in acrylics ... homework, assignments, she takes full advantage. 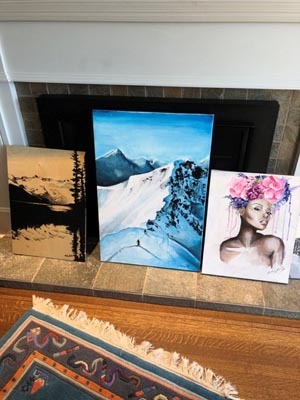 Her easel is set up in the front living room of her very supportive parents' home. It’s a greenhouse of creativity. All of her paintings spoke to me but one stood out, a little different from the rest. It’s a large collage of a Back-hoe working in a garbage heap but I do a double take because it’s not shovelling Trash as I would expect, it’s pushing beautiful little torn drawings of nature, shells, birds, delicate sea creatures. The message is powerful and haunting. Sabine is telling her stories and speaking her thoughts and concerns with her wonderful paintings.